Since 1895, when Wilhelm Röntgen produced his first x-ray (of his wife’s hand), physicians have used imaging to "see" beneath the skin, having progressed from these early modalities to advanced imaging such as magnetic resonance imaging (MRI) and ultrasonography. These nonionizing imaging modalities afford significant resolution, allowing clinicians to appreciate the structure and anatomic relationships between joints, tendons, ligaments, and muscles. Despite significant technological advancements since Röntgen's discovery, patients who present with common musculoskeletal complaints are routinely still evaluated only by x-ray. Not surprisingly, these studies often produce negative results, since x-rays offer poor visualization of ligaments, muscles, and other soft tissues. MRI is the best imaging modality for anatomic detail, but expense, availability, and even claustrophobia preclude its widespread use. Additionally, MR images are limited by being static. Joint aspiration, or arthrocentesis, is one of the most commonly performed procedures in the evaluation and treatment of joint diseases. Joint aspiration may aid in diagnosis by assessing synovial fluid for the degree of inflammation and for the presence of pathologic agents such as crystals or microorganisms. Additionally, arthrocentesis may prove therapeutic in some cases by relieving intra-articular pressure and by injecting intra-articular drugs (eg, steroids). Musculoskeletal ultrasound (MSUS) includes 2 principal modes: B-mode (or gray scale) that provides morphological information of the anatomic structures and Doppler mode (color Doppler or power Doppler) that allows evaluation of blood flow. MSUS should be performed with high-resolution linear transducers (ie, probes) with frequencies between 6 and 14 MHz for deep/intermediate areas to ≥15 MHz for superficial areas. Tissue harmonic imaging, spatial compound imaging, extended field of view (panoramic), and virtual convex imaging are some of the software capabilities that may be useful in MSUS. When scanning a joint, the probe should be oriented as perpendicular or parallel to the bony cortical surface (bony acoustic landmark) so that the cortical margin appears bright, sharp, and hyperechoic. A dynamic scanning technique by means of slight movements of translation (side-to-side, back-to-front), angulation, and rotation of the probe should be carried out to allow the best visualization of the structure(s) of interest. MS structures should be evaluated as they move smoothly either actively or passively. 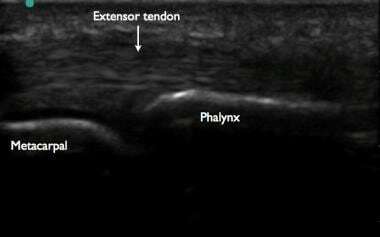 To avoid anisotropy (ie, hypoechoic/anechoic appearance of a normally hyperechoic structure that mainly affects tendons) and the common pitfalls that accompany it, the probe should be continuously adjusted to maintain the beam perpendicular to the tendon fibers, especially in insertional regions. When the long axis of the structure of interest corresponds to the cranial-caudal orientation of the anatomic position, the most proximal aspect of the structure is usually placed on the left-hand side of the screen. However, other options are acceptable as long as the movement of the image on the screen is kept parallel to the direction of the probe on the patient. Our preference for short axis is to align the structure of interest on the screen as if the observer is looking at the patient. Probe compression can be helpful in distinguishing a compressible liquid collection from a non-compressible solid. Little or no compression is important when performing Doppler examination to avoid cessation of flow in small vessels. A generous amount of gel should be used for superficial structures especially when little or no pressure is indicated. The machine setting for B-mode and Doppler mode should be properly adjusted to optimize the US image acquisition process. Ultrasonography has many diagnostic musculoskeletal applications, as noted below. This article focuses primarily on the use of ultrasonography for joint evaluation and for procedural guidance of arthrocentesis. Unlike x-rays and computed tomography (CT) scans, ultrasonography does not use ionizing radiation. It is noninvasive and does not require the use of contrast medium (dye). No absolute contraindications exist to diagnostic ultrasonography. However, patient positioning and comfort could preclude the use of ultrasound in some circumstances. While no absolute contraindications exist to arthrocentesis, relative contraindications do exist, and, as with all procedures, the risks and benefits should be considered and discussed with the patient before beginning. Inserting a needle through an overlying skin infection could theoretically seed the joint with bacteria from the skin. Therefore, try to avoid areas of the skin suspicious for cellulitis. In general, diagnostic ultrasonography does not require any anesthesia. If, however, arthrocentesis is also performed, then local anesthesia will be needed. Patients who are particularly anxious or in severe pain may require procedural sedation. After identification of the optimal needle entry site (please see Technique section below for specific sites based on joint of interest), clean, drape, and prepare the region in the usual sterile fashion. Using a 25- or 27-gauge needle, begin by making a subcutaneous skin wheal using an anesthetic (eg, 1% lidocaine without epinephrine) and then inject an additional 1-3 mL of anesthetic into the subcutaneous tissue overlying the chosen needle insertion site. The type of transducer is an important consideration. Some transducers are well-suited to musculoskeletal ultrasonography, while others are designed for visualization of deeper structures. An ultrasound transducer is designed to operate by emitting sound waves within a specific frequency range. The higher the frequency, the better the image resolution. This improved resolution, however, comes at the cost of sound wave penetration into tissues and results in poor visualization of deeper structures. Conversely, a transducer with a lower frequency range permits deeper tissue penetration but results in lower resolution images. For most musculoskeletal applications, the linear, or small-parts, transducer is most useful (see image below). This is a high-frequency probe that provides high-resolution images of more superficial structures. In the obese patient with a significant amount of soft tissue overlying the joint of interest, a curvilinear probe, which has a lower frequency and greater tissue penetration, may be helpful. In general, position the patient at a comfortable height and location for the examiner. The clinician performing the examination should be able to easily reach both the patient and the ultrasound machine without having to stretch, stoop, lean, or bend excessively to examine the patient. Specific patient positioning depends on the particular joint of interest; see Technique section below for details. As with positioning, specific technique depends on the particular joint being examined. However, the following general techniques are important to understand and are applicable regardless of the joint, musculoskeletal region, or even organ system that is being evaluated. Every ultrasound probe has an indicator (usually a mark or palpable protuberance) that identifies the probe's leading edge. The opposite end of the probe (without the indicator) is called the receding edge. The leading edge of the probe corresponds to the left side of the screen, and the receding edge corresponds to the right side of the screen (the transducer:screen relationship can be remembered by Leading edge:Left side of screen and Receding edge:Right side of screen). One can apply gel to the transducer and touch one end to confirm which side is which. To produce an ultrasound image, an ample amount of acoustic gel should be placed on the probe. The probe should be placed on the region of interest with the leading edge pointed either toward the patient's head (cephalad) or toward the right side of the patient's body. Once the transducer is placed on the patient's skin, a rectangular image (if using the linear array probe) will be displayed on the screen. The top of the image is called the near field and represents the superficial tissues nearest the probe. The bottom of the screen is called the far field and represents the deeper tissues further from the probe. The left side of the screen represents the probe's leading edge (which should be pointed toward the patient's head or right side), and the right side of the screen represents the probe's receding edge (which should be pointed toward the patient's feet or the patient's left side). In the images below, the practitioner is evaluating the patient's knee; the femur is cephalad and the tibia is caudad relative to the probe. The transducer's leading edge is aimed cephalad (toward the femur), which appears on the left side of the screen. Anterior approach to visualizing a knee effusion with ultrasonography. This medial approach demonstrates the femur at the leading edge of the screen, oriented toward the patient's head, with the tibia at the receding edge. The ultrasound image shown is created by emitting sound waves from the transducer and then "listening" for the reflected sound waves that return. The ultrasound machine processes the intensity of the returning echoes to create an image on the screen according to a grayscale spectrum of black, white, and many shades of gray. Whether a particular structure appears black, white, or gray on the screen depends on the tissue's echogenicity, which, in turn, depends on the tissue's density, water content, and elasticity. Black (anechoic) shapes generally represent fluid or artifact. Gray, or hypoechoic, images represent "soft" tissues and white, or hyperechoic, images represent dense tissues. The table below lists the echogenicity of various tissues. Sonographic examples of bone, muscle, and tendon are also shown. Ultrasonographic image of muscle tissue (outlined in green). Note how muscle tissue is hypoechoic and striated. Ultrasonographic image of a finger. Note the hyperechoic bone tissue of the metacarpal and phalanx. Extensor tendon is in the near field; note how the tendon is hyperechoic and striated compared to the hypoechoic striations of muscle. Biceps brachii anatomy. Note the tendon sheath of long head of biceps brachii, highlighted in blue. To begin, have the patient sit on a rotating stool, if possible. Place the patient's arm in a neutral position with the elbow at his or her side and the dorsum of the hand lying on the thigh. Holding the linear array transducer with the leading edge aimed toward the patient's right side, visualize the tendon sheath of the long arm of the biceps brachii in the short axis (cross-sectional view). Proper technique and patient positioning are shown in the image below. Technique for obtaining short axis view of the biceps brachii tendon. Under normal circumstances, only a minimal amount of fluid should be seen between the biceps brachii tendon and the tendon sheath. With the presence of a glenohumeral joint effusion, fluid dependently travels from the glenohumeral joint space inferiorly and collects between the biceps brachii tendon and the tendon sheath. 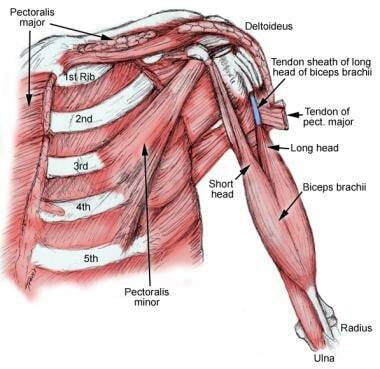 An example of a normal-appearing biceps brachii tendon is shown in the image below. Normal biceps brachii tendon and surrounding tendon sheath. To aspirate the glenohumeral joint, begin by preparing the skin with cleansing solution and draping the shoulder with a sterile cover. Insert an 18-gauge needle attached to a syringe midway between the coracoid and the anterolateral corner of the acromion. Direct the needle posteriorly and slightly inferiorly. For details, see Medscape Reference topic Shoulder Arthrocentesis. Illustration of knee joint. 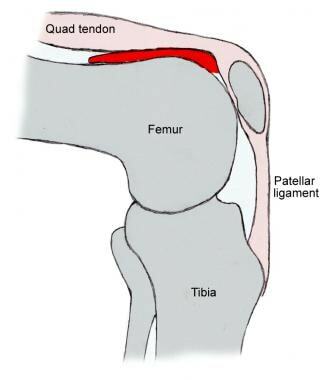 Note suprapatellar recess in red. The best way to visualize fluid in the suprapatellar recess is via the anterior approach. Begin by placing the patient in the supine position with the knee exposed and slightly flexed (placing a rolled towel behind the patient's knee may aid in positioning), as shown in the image below. Anterior approach to imaging the knee. 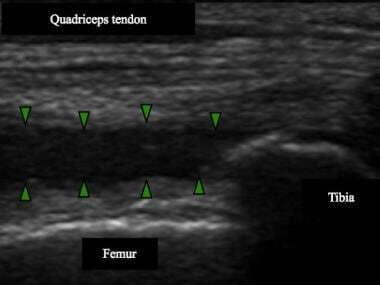 Place the linear array transducer parallel to the quadriceps femoris muscle tendon just superior to the patella. This provides a longitudinal, or long axis, view of the quadriceps femoris muscle and tendon as well as the suprapatellar recess. Sweep the probe proximally and distally along the quadriceps muscle and tendon to visualize the entire suprapatellar space. Synovial fluid within the space appears anechoic (black). Knee effusion and knee hemarthrosis are shown in the image below. The image was acquired using the anterior approach described and shown above. 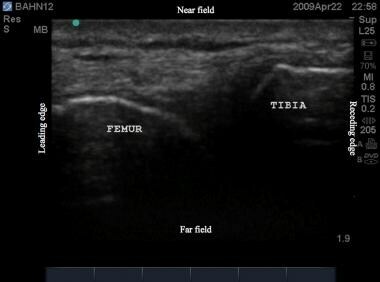 Note the fibrillar quadriceps tendon in the near field, the hyperechoic (white) femur in the far field, and the patella at the receding (right) edge. The anechoic fluid bounded by the green arrowheads indicates the presence of a joint effusion and is fluid within the suprapatellar space. Note knee effusion in suprapatellar recess (bounded by green arrows). The most common approach to knee arthrocentesis is the lateral approach at the level of the superior pole of the patella. The skin is prepared in the usual manner, and the superolateral aspect of the patella is palpated. An 18-gauge needle is inserted 1 fingerbreadth superior and lateral to this point. The needle is angled at a 45-degree angle beneath the patella. For details, see Medscape Reference article Knee Arthrocentesis. Ankle effusions can be caused by local factors such as infection, gout, or occult fracture or by systemic processes such as hemophilia, sickle cell disease, or rheumatoid arthritis. While conventional x-rays require up to 5 mL of synovial fluid before an ankle effusion can be detected, ultrasonography requires as little as 2 mL of fluid. [19, 20] The image below depicts normal ankle anatomy for reference. 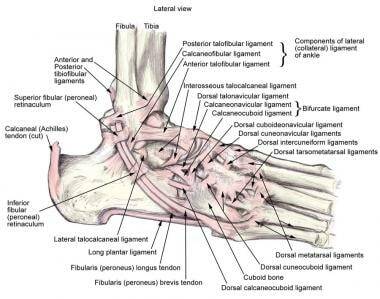 Illustration of normal ankle anatomy. The most sensitive location to identify an ankle joint effusion is over the anterior recess of the tibiotalar joint. An anterior approach to evaluating the ankle should be used: the linear array probe is oriented longitudinally at the level of the tibiotalar joint with the foot in mild plantar flexion; as always, the probe's leading edge should be aimed cephalad. Once properly positioned, the tibia is seen at the left side of the screen (leading edge) and the talus is seen at the right side of the screen (receding edge). An example of correct probe placement and normal anatomy is shown in the first image below; in the second image, note the hypoechoic anterior fat pad between the tibia and talus. Ultrasonographic approach to imaging a tibiotalar (ankle) effusion. 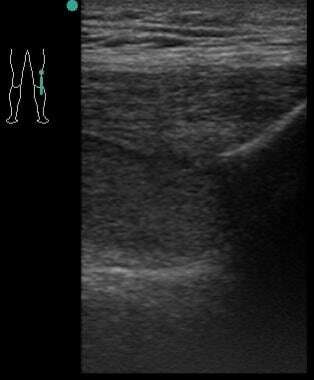 Ultrasound image of normal ankle anatomy. The tibia is at the left side of the screen (the leading edge). 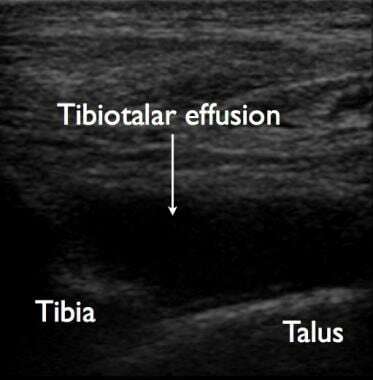 An ankle effusion appears as an anechoic region in the anterior recess between the tibia and talus (see image below). 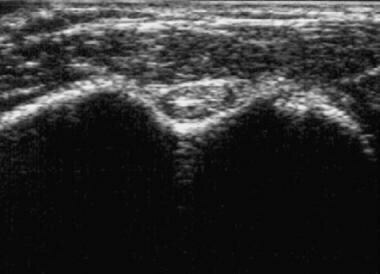 Ultrasonographic image of a tibiotalar joint effusion. The effusion is in the anterior recess between the tibia and talus. The anterolateral approach to ankle arthrocentesis is preferred because it reduces potential injury to the dorsalis pedis artery and peroneal nerve. Following usual preparation, skin cleansing, and draping, a needle is inserted at the joint line midway between the base of the lateral malleolus and the lateral border of the extensor digitorum longus. Extension of the foot by the practitioner against the patient's resistance may help to identify this space. The needle should be advanced perpendicular to the fibular shaft. For details, see Medscape Reference article Ankle Arthrocentesis. Hip effusions can be common in patients with inflammatory diseases such as rheumatoid arthritis, but they can also arise in normal joints affected by osteomyelitis, trauma, toxic synovitis, and Legg–Calve-Perthes disease in children. 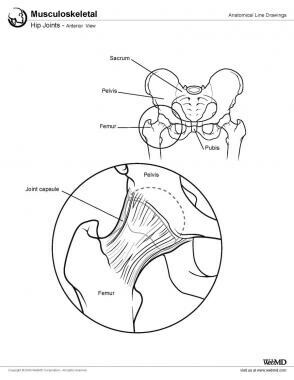 [21, 22, 23, 3, 24] The most serious cause of hip effusions in both the adult and pediatric populations is septic arthritis, as it can lead to rapid joint destruction and significant morbidity. Plain films are not sensitive for detecting effusions, and magnetic resonance imaging (MRI) is typically unavailable in the emergency department. See the images below. Illustration of normal hip anatomy. Anterior approach to imaging the hip. Ultrasound marker is directed toward umbilicus (red arrow). The approach most often used to examine a hip effusion is the anterior approach with the patient in a supine position and the hip in slight flexion and internal rotation. This position allows the fluid collection to move anteriorly. Transducers used include the 3- to 5-MHz curved array or 7.5- to 10-MHz linear array, and the probe should be placed in a sagittal oblique plane parallel to the long axis of the femoral neck, with the marker pointing toward the umbilicus. In this view, landmarks visualized include the femoral head and neck, acetabulum, ileofemoral ligament, and the anterior synovial recess. It is important to locate femoral vessels and position the probe lateral to the femoral vessels. Arthrocentesis is a sterile procedure, and the hip should be prepared and draped for needle aspiration. 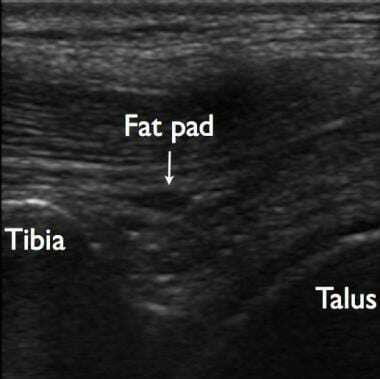 Following the technique described above, the femoral head should be visualized on the ultrasound screen. A sterile 18- to 22-gauge spinal needle attached to a 20-mL syringe can be used to aspirate the effusion under direct visualization. To achieve adequate ultrasound images, remember to apply plenty of acoustic gel and pressure with the transducer. The 2 most common reasons for obtaining poor-quality images are too little gel and too little pressure. The gain adjusts the amplification of the returning signal. Adjust the gain as needed to make black (anechoic) objects appear black on the screen. For example, if a urine-filled bladder appears gray (hypoechoic), decrease the gain to make it black (anechoic). If bone appears gray (hypoechoic), increase the gain to make it white (hyperechoic). By adjusting gain consistently, all tissues are displayed and recognized according to their relative echogenicity. Anisotropy is a well-described phenomenon in medical ultrasound imaging; it describes any property that is directionally-dependent. Many tissues, such as tendons, have a lot of anisotropy, which means that their echogenicity is dependent on the angle of the ultrasound probe. To achieve the best possible images, hold the probe at 90 degrees to the tissue or structure of interest. The angle of insonation should be 90 degrees for B-mode images. Allergic reactions from hypersensitivity to local anesthetics can occur. Frequently, this is due to the preservative and not to the anesthetic itself. In such cases, using a preservative-free anesthetic prevents this problem. For more details, see Medscape Reference article Infiltrative Administration of Local Anesthetic Agents. Local bruising at the injection or arthrocentesis site may occur. Damage to cartilage, tendons, or blood vessels can occur with improper needle placement. This can be avoided by reviewing the anatomy prior to the procedure and by using ultrasonographic guidance to help identify and avoid these structures. Generally, hemarthroses are small and require no specific treatment. However, a hemarthrosis in a coagulopathic patient requires correction of the coagulopathy. Hematology consultation should be considered. Hemarthrosis is pictured in the image and videos below. Ultrasound video of hemarthrosis from anterior, medial, and lateral approaches. Klauser AS, Tagliafico A, Allen GM, Boutry N, Campbell R, Court-Payen M, et al. Clinical indications for musculoskeletal ultrasound: a Delphi-based consensus paper of the European Society of Musculoskeletal Radiology. Eur Radiol. 2012 May. 22 (5):1140-8. [Medline]. Punzi L, Oliviero F. Arthrocentesis and synovial fluid analysis in clinical practice: value of sonography in difficult cases. Ann N Y Acad Sci. 2009 Feb. 1154:152-8. [Medline]. Dewitz A, Jones R, Goldstein J. Additional Ultrasound-guided Procedures. Ma OJ, Mateer JR, Blaivas M, eds. Emergency Ultrasound. 2nd ed. New York, NY: McGraw-Hill; 2008. 20. Reichman E, Waddell R. Arthrocentesis. Reichman E, Simon R. Emergency Medicine Procedures. 2003. 559-584. Barr L, Hatch N, Roque PJ, Wu TS. Basic ultrasound-guided procedures. Crit Care Clin. 2014 Apr. 30 (2):275-304, vi. [Medline]. Möller I, Janta I, Backhaus M, et al. The 2017 EULAR standardised procedures for ultrasound imaging in rheumatology. Ann Rheum Dis. 2017 Aug 16. [Medline]. Schueller-Weidekamm C. Quantification of synovial and erosive changes in rheumatoid arthritis with ultrasound-Revisited. Eur J Radiol. 2009 Mar 12. [Medline]. Chen MJ, Lew HL, Hsu TC, Tsai WC, Lin WC, Tang SF, et al. Ultrasound-guided shoulder injections in the treatment of subacromial bursitis. Am J Phys Med Rehabil. 2006 Jan. 85(1):31-5. [Medline]. Thiele RG, Schlesinger N. Diagnosis of gout by ultrasound. Rheumatology (Oxford). 2007 Jul. 46(7):1116-21. [Medline]. Giovagnorio F, Andreoli C, De Cicco ML. Ultrasonographic evaluation of de Quervain disease. J Ultrasound Med. 1997 Oct. 16(10):685-9. [Medline]. Liu SS, Ngeow JE, Yadeau JT. Ultrasound-guided regional anesthesia and analgesia: a qualitative systematic review. Reg Anesth Pain Med. 2009 Jan-Feb. 34(1):47-59. [Medline]. Thumboo J, O'Duffy JD. A prospective study of the safety of joint and soft tissue aspirations and injections in patients taking warfarin sodium. Arthritis Rheum. 1998 Apr. 41(4):736-9. [Medline]. Johnson SM, Saint John BE, Dine AP. Local anesthetics as antimicrobial agents: a review. Surg Infect (Larchmt). 2008 Apr. 9(2):205-13. [Medline]. Hollister MS, Mack LA, Patten RM, Winter TC 3rd, Matsen FA 3rd, Veith RR. Association of sonographically detected subacromial/subdeltoid bursal effusion and intraarticular fluid with rotator cuff tear. AJR Am J Roentgenol. 1995 Sep. 165(3):605-8. [Medline]. Jacobson JA. 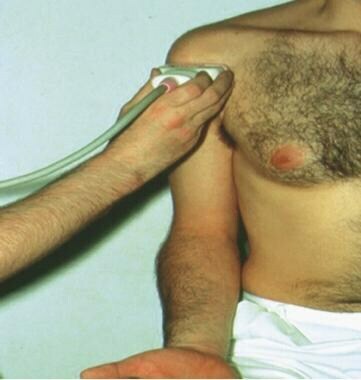 Shoulder Ultrasound. Fundamentals of Musculoskeletal Ultrasound. 2007. 63. Hirsch G, O'Neill T, Kitas G, Klocke R. Distribution of effusion in knee arthritis as measured by high-resolution ultrasound. Clin Rheumatol. 2012 Aug. 31 (8):1243-6. [Medline]. Jacobson JA. Knee Ultrasound. Fundamentals of Musculoskeletal Ultrasound. 2007. 238-239. Sibbitt WL Jr, Kettwich LG, Band PA, Chavez-Chiang NR, DeLea SL, Haseler LJ, et al. Does ultrasound guidance improve the outcomes of arthrocentesis and corticosteroid injection of the knee?. Scand J Rheumatol. 2012 Feb. 41(1):66-72. [Medline]. Jacobson JA, Andresen R, Jaovisidha S, De Maeseneer M, Foldes K, Trudell DR, et al. Detection of ankle effusions: comparison study in cadavers using radiography, sonography, and MR imaging. AJR Am J Roentgenol. 1998 May. 170(5):1231-8. [Medline]. Jain M, Samuels J. Musculoskeletal ultrasound as a diagnostic and prognostic tool in rheumatoid arthritis. Bull NYU Hosp Jt Dis. 2011. 69(3):215-9. [Medline]. Tsung JW, Blaivas M. Emergency department diagnosis of pediatric hip effusion and guided arthrocentesis using point-of-care ultrasound. J Emerg Med. 2008 Nov. 35(4):393-9. [Medline]. Freeman K, Dewitz A, Baker WE. Ultrasound-guided hip arthrocentesis in the ED. Am J Emerg Med. 2007 Jan. 25(1):80-6. [Medline]. Minardi JJ, Lander OM. Septic hip arthritis: diagnosis and arthrocentesis using bedside ultrasound. J Emerg Med. 2012 Aug. 43(2):316-8. [Medline]. Minardi J, Denne N, Miller M, Larrabee H, Lander O. Acute arthritis of the hip--case series describing emergency physician performed ultrasound guided hip arthrocentesis. W V Med J. 2013 Sep-Oct. 109 (5):22-4. [Medline]. An example of anisotropy is shown. 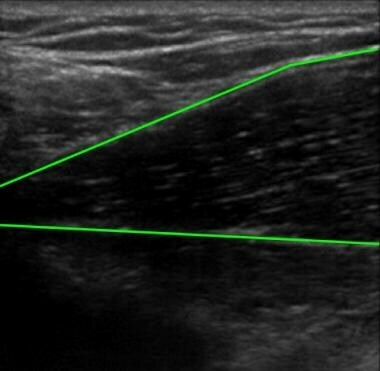 Note how the echogenicity of the extensor tendon of the finger decreases near the leading edge (green arrows) as the angle between the probe and the tendon deviates from 90 degrees.